The Commodity Supplemental Food Program (CSFP) supports the nutritional needs of low-income individuals by providing wholesome food to supplement their diet, while helping stretch their food dollars. The population served by CSFP is low-income seniors at least 60 years of age who are at risk of and vulnerable to malnutrition. 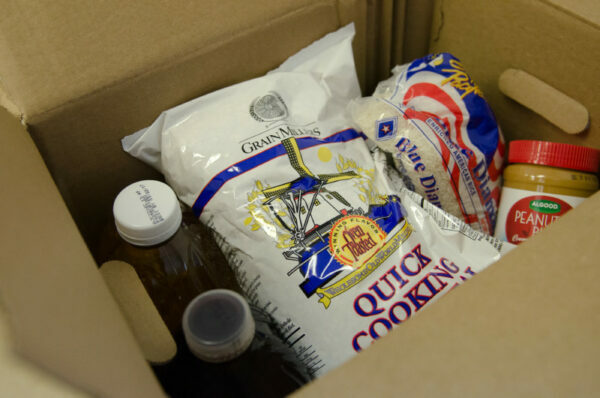 Feed More’s CSFP support staff and volunteers distribute the nutritious, pre-packaged, shelf-stable boxes monthly. Each contains nutrient-rich food that helps improve the overall health status of these individuals. Boxes include a variety of canned items (e.g., fruit, vegetables, meat or fish), bottled juice, shelf-stable and instant dry milk, cheese, pasta or rice, dry beans or peanut butter and cereal. For more information on Feed More’s CSFP and to learn how to participate in this program, please email our USDA Programs Manager for additional details. If you wish to file a Civil Rights program complaint of discrimination, complete the USDA Program Discrimination Complaint Form online or at any USDA office, or call (866) 632-9992 to request the form. You may also write a letter containing all of the information requested in the form. Send your completed complaint form or letter to us by mail at U.S. Department of Agriculture, Director, Office of Adjudication, 1400 Independence Avenue, S.W., Washington, D.C. 20250-9410, by fax (202) 690-7442 or email at program.intake@usda.gov.